Released as part of the WorkCentre 7800 series, the Xerox 7845 gives you a storage size of 160 GB, and it has a printing dpi of 1200 x 2400. The Xerox 7845 features lightning fast printing capabilities at 45 pages per minute in color and 45 pages per minute in monochrome: That is almost one printed page per second. 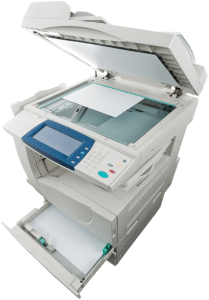 This machine can sustain the demands of a large-sized office considering it also comes with a monthly duty cycle of 200,000 pages per month. If you want a copier that will save on paper, the automatic duplex feature will mean less paper used at the copier. The WorkCentre 7845 has a warm-up time of 3.23 minutes, and you will see your first print after 7.7 seconds in monochrome and 9 second in color. With the WorkCentre 7845, you receive a maximum paper tray of 4,180 pages. It supports six input trays, but the default product comes with four, and depending on the needs of your office, you can decide if you need greater than that. In terms of scanning capabilities, you receive a 600 x 600 dpi machine and an 24-bit color depth. Similar to other copiers in the WorkCentre 7800 series, it comes with a standard two gigabytes. The Xerox WorkCentre 7845 features an intuitive touchscreen that guarantees you accomplish the job without a headache. At the same time, it will drive down costs and increase the productivity of your office.